- Shared sense of community among other museum patrons. - Playing at the playground next door. Arrive early, as all backpacks, strollers and large bags will need to be checked. Summer can be a busy time, so expect queues. These, however, will keep moving at a regular pace. Try to arrive when it opens to avoid the crowds. The Guggenheim Bilbao is a must see and a highly visited sight throughout Western Europe for any art lover. Most people stop over in Bilbao just to see The Guggenheim Museum Bilbao, and it's well worth the visit. Best of all, it’s very kid-friendly and has workshops to help children as young as 2 recognize art in their own way. Afterwards, kids can blow off any leftover steam in the playground behind the museum, while parents watch them from an outdoor café. Part of the consortium of Guggenheim museums around the globe, The Guggenheim Bilbao is a world-class art and cultural institution. The outer structure is magnificent in scale and beauty. Inside the building, there's no mistaking that steel and glass are what make this institution so special and meaningful. After Frank Gehry designed this building, many of the other buildings in Bilbao followed suit in creating formidable structures of steel around the city. 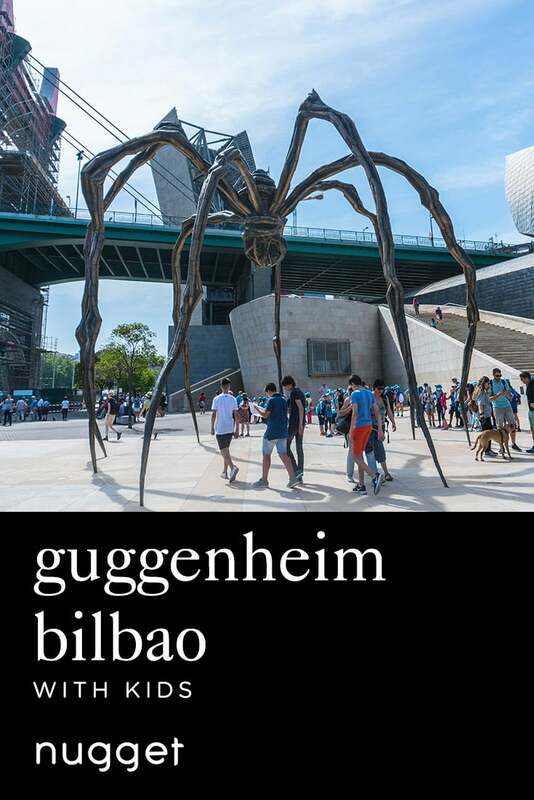 While famous for its contemporary art exhibitions and permanent collection, The Guggenheim Bilbao, in particular, is child-friendly. It has many children’s education programs, including “baby art” workshops for kids as young as 2. DIRECTIONS The Guggenheim is located in the city center. You cannot miss it. You can get there on foot from within the city center, take a taxi, or take public transportation via bus, tram or metro. TIP It can get crowded, so just keep an eye on the kids. However, it's so noisy inside you won't have to worry about keeping the kids quiet. No photography or touching of art is allowed. The kids may breathe a sigh of relief as they release all the energy they had to contain somewhat while touring the museum. Parents will be delighted to see the outdoor cafe and bar that is outfitted with several tables and chairs - all with a comfortable view of the play area. DIRECTIONS This combination cafe, bar and playground is located directly next to the Guggenheim Bilbao Museum. You cannot miss it - you can even spot it from a distance. TIP It can get crowded, so just keep an eye on the kids. There's no photography allowed and no touching of art work. However, it's noisy inside so you don't have to worry about keeping the kids quiet! WE LOVEDIts location was perfect for what we wanted to see, eat and do. I also loved the 1- bedroom suite, where my husband and I could have a little privacy while our daughter slept.